A locus of control orientation is a belief about whether the outcomes of our actions are contingent on what we do (internal control orientation) or on events outside our personal control (external control orientation). The Locus of Control is a concept in psychology originally developed in the 1950s. 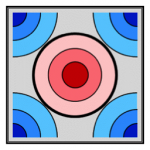 The two ‘loci’, as established by the theory, are the internal and external loci. The Locus of Control represents how a person’s decision making ability is influenced; essentially, those who make choices primarily on their own are considered to have internal loci, while those who make decisions based more on what others desire are said to have external loci. People with external loci are generally more apt to be stressed and suffer from depression as they are more aware of work situations and life strains. Women tend to have more of an external locus than men. A more internal locus of control is generally seen as desirable. Having an internal locus of control can also be referred to as “personal control”, “self-determination” etc. Males tend to be more internal than females. Julian Rotter’s original (1966) locus of control formulation classified generalized beliefs concerning who or what influences things along a bipolar dimension from internal to external control: “Internal control” is the term used to describe the belief that control of future outcomes resides primarily in oneself while “external control” refers to the expectancy that control is outside of oneself, either in the hands of powerful other people or due to fate/chance. Generally, the development of locus of control stems from family, culture, and past experiences leading to rewards. Most internals have been shown to come from families that focused on effort, education, and responsibility. On the other hand, most externals come from families of a low socioeconomic status where there is a lack of life control. Locus of control is one aspect of personality. 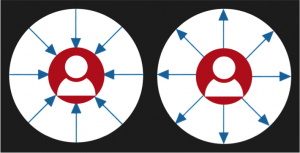 Leaders with an internal locus of control can adapt their leadership style as required to achieve the leadership objectives effectively and efficiently. People described as having an internal locus of control believe that they can exercise some or a lot of control over events affecting them. By contrast, people who have an external locus of control, tend to believe that they have little or no control over what happens to them. Individual with internal Locus of Control have high motivation for achievement and low outer directedness. On the other side externals always keep trying to search out explanations for their failures. This is not to say, however, that an internal locus of control is “good” and an external locus of control is “bad.” There are other variables to be considered, however, psychological research has found that people with a more internal locus of control seem to be better off, e.g. they tend to be more achievement oriented and get better paying jobs. 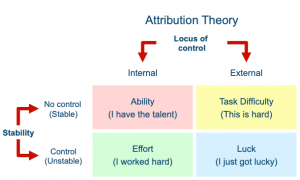 When combined with the growth vs. fixed mindset component, we get Weiner’s attribution theory that deals with motivation. The diagram above shows Weiner’s attribution theory. When a child has a fixed mindset, they view things as being due to ability or chance, neither of which encourages students to try very hard! In the “control” area, we see effort and task difficulty. Control, in this case, doesn’t necessarily mean something that a child has control over, but instead something that somebody has control over. When external, the student may see the task as being difficult because a teacher made it that way. When internal, that’s when we see kids have a growth mindset. And when children have a growth mindset, they are more likely to make attempts to improve their skills when a task is difficult. Locus of control is about a person’s confidence that he or she can control events in their lives. Individuals with an internal locus of control have a strong sense of self-responsibility and that they have the power to change their lives. Externally-controlled individuals believe that they are not in control of their lives and it is instead chance, opportunities, and other individuals and events (i.e., the circumstances) that determine their destiny. Classroom applications: As everyone knows, generally in an educational setting knowledge flows from the teacher to the student. This type of environment could cause students to withdraw. It is suggested that students take more of an active control in the learning process. Weiner’s theory applies to every teacher. If we take a look at self-concept, there is a correlation between internal locus of control, and experiencing pride if a student were to do well in a class that normally is considered to be tough. On the other hand, a student does not view it as a success if they receive a good grade from a teacher who always gives high grades at the end of the quarter. Attributions are the perceived causes that individuals select or construct for events in their lives. 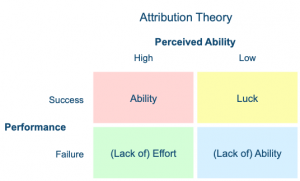 Attribution theory deals with what people believe about why they succeed or fail at different tasks and the effects on future behavior or learning. A basic assumption of attribution theory is that a person’s understanding of the causes of past events influences his or future actions. There is a large number of possible causes for any specific success or failure. A relatively small number of causes appear repeatedly in relation to many situations, however. Weiner (1985) has presented the most ambitious attributional theory of achievement motivation and emotion. This theory deals with the perceived causes of success and failure, the characteristics of causal thinking, and subsequent emotional experiences in relation to achievement behaviors. According to Weiner, the most important factors affecting attributions are ability, effort, task difficulty, and luck. He classified attributions along three causal dimensions, locus of control; stability; controllability. Stability refers to how likely it is the probability of causes will change over time. For example, Allison failed her math test, but she attributed this failure to lack of sleep the night before. Allison might consider this situation unstable because the attributed cause – fatigue – would likely change in the future. Stability is directly related to one’s expectancy for success.